Love the look of that quality costume or mascot, but only need it for a special event or theatre play? Why pay full price for a costume just to put it in storage never to be used again. We would love to work with your business or stage production to make sure you have the perfect look at an affordable price. To give enough time to have everything in order, we encourage you to make your reservation as soon as possible. Payment is not required until time of pick up, however, deposits may be needed to reserve your spot for higher end costumes. Prices for costume rentals vary based on the price of the costume. Typically an adult costume will cost the greater of $40.00 or 10% of the retail price of the costume and $20.00 for children’s sizes. Call for a price quote on the costume of your choice. When calling we will need to know the date that you plan to use the costume. Our rentals are for up to 3 days during the week or for pick up on a Friday and return on Monday. This will allow you to pick up the costume the day before you need it and return the day after you used it. There will be no allowance if you need it for less time. A discounted fee will be offered if additional time is needed. A $20 non-refundable deposits may be required to reserve certain costumes, Payment in full is required at time of pick up. You may pay by credit card. paypal, check or cash. Can't pick up the costume? We would be happy to ship it to you! Shipping costs will be added to the cost of the rental. You will be resposnible to pay for costs to ship the costume rental back to us in time. You must be at least 18 years old to rent a costume. Parents may gladly rent costumes for their children. You can’t be too old to rent a costume. You must provide us with a valid driver’s license or state I.D. You will need to leave a valid credit card on file to serve as security deposit. I, the undersigned do hereby agree to return all of the rented goods, in good condition, on the date listed in the return date box above. If items are returned late, I agree to pay an additional rental fee of one third of the rental price for each additional day. I also agree to pay for all transportation charges, and any collection and / or replacement cost, including reasonable attorney fees. Costumes will be reserved when the total rental amount is paid in full. I agree to pay a $20.00 fee per costume in the event I should cancel this rental. A credit card will be retained as security deposit, in case of failure to return the costume, All Seasons for All Reasons reserves the right to charge the credit card the retail price of the costume. I agree any late fees or lost or damaged costume fees may be charged to my credit card. Damaged costumes will be charged a minimum $10.00 fee. On the rare occasion a costume that you have rented may become lost, damaged or returned late by a previous customer we will gladly offer a replacement costume of equal or greater value or your money will be refunded. 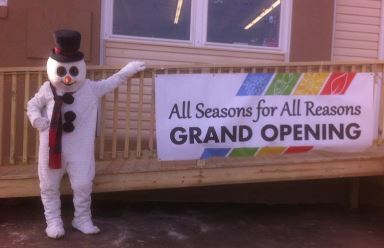 All Seasons for All Reasons and its employees assume and accept no liability for any injuries or accidents while anyone is wearing any of our costumes. I understand and agree that each costume described above is intended to represent only the character specifically described named and no other character. I also understand and agree that each such costume should not be referred to or portrayed as any other character, and I represent and warrant that I will not permit any reference to or portrayal of such costume as any other character. I understand and agree that All Seasons for All Reasons has no responsibility for any reference to or portrayal of any such costume as anything other than what that costume is specifically described or named above. I agree to release and defend All Seasons for All Reasons from any and all claims brought by third parties for infringing their characters or design.